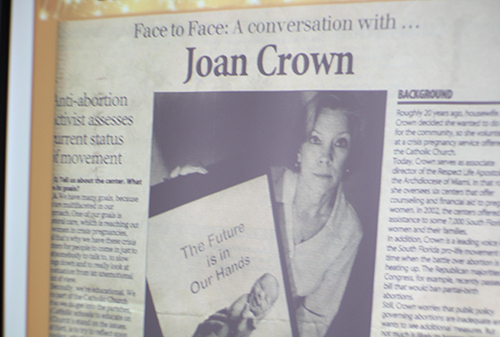 PowerPoint depicts an early newspaper article featuring Joan Crown’s pro-life work. DAVIE | The retirement of pro-life icon Joan Crown marks the end of an era for the Archdiocese of Miami Respect Life Office. Hailed as a trailblazer by her peers, Crown is the longest serving pro-life leader in the 41-year history of the archdiocesan ministry. She began as a volunteer in 1981, when the ministry was still in its infancy – just eight years after the Supreme Court’s landmark Roe vs. Wade decision legalized abortion on demand in the U.S.
“I believe she has saved hundreds, if not thousands, of pre-born children and has helped so many mothers to be mothers, and fathers as well,” said former Respect Life Director Father Jordi Rivero, who concelebrated the Mass with Father Alfred Cioffi, the ministry’s spiritual director, and St. David’s pastor, Father Steven O’Hala. “She really was the face of Respect Life in the Archdiocese of Miami for all these years and she will be greatly missed,” said fellow pro-life warrior Father Dominic O’Dwyer, pastor of St. Malachy in Tamarac, who was unable to attend the event. He credited Crown with bringing people in the various Respect Life offices together and especially promoting Project Rachel and the importance of post-abortion healing for women who had abortions. 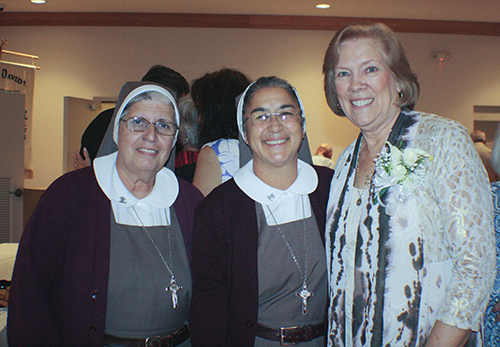 Former members of the Archdiocese of Miami Respect Life ministry, Sister Carmen Ors, left, and Sister Maria Jose Socias, of the Servants of the Pierced Hearts of Jesus and Mary, pose for a photo with Joan Crown at her retirement reception at St. David Parish Oct. 20. Powerpoint image of Joan Crown pictured with her granddaughter, Stella. 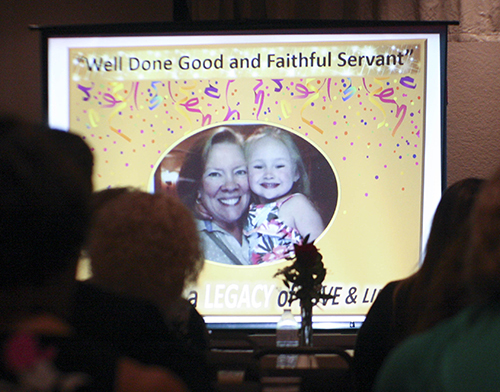 It was shown as part of a presentation on Crown's life and times at a reception in her honor Oct. 20 at St. David Parish in Davie. Barbara Groeber, former educational coordinator of the ministry, who retired in 2016 and began her career with Crown, recounted her friend’s first exposure to pro-life work in 1981. She had been invited by a neighbor to attend a talk given by the recently deceased Father Daniel Kubala, founding director of the ministry, to promote awareness about abortion. It proved a pivotal moment for Crown who, shocked at learning that women could abort their child during all nine months of pregnancy, made a life-long commitment to defend the unborn. “Most people, when they hear these things, get kind of sad and go about their everyday lives, but Joan became the first volunteer program coordinator to run the ministry’s second facility in South Broward,” Groeber said. In 1984, Crown became associate director of the ministry and in 2006 she was appointed director, succeeding Father Rivero. “Joan started down this path of a total yes to God. It is one of those things like becoming a parent, you look back and think, if I knew what was involved, I wouldn’t have the nerve to do it,” Groeber said. Despite those many obstacles, the Respect Life ministry experienced tremendous growth with Crown at the helm. There are now five pregnancy care centers located throughout the Archdiocese of Miami serving hundreds of clients each month. Each of the pregnancy centers is equipped with ultrasound technology, ready to introduce a new mother to her unborn child. The father's mentoring program, Project Joseph, also has helped hundreds of fathers become responsible parents. Yet as far as Crown is concerned, “the battle” continues: to counteract the willingness of so many today to take the life of their own children in order to solve social problems, as well as the hesitance of many to recognize the urgent need to change minds and hearts to stop abortion. 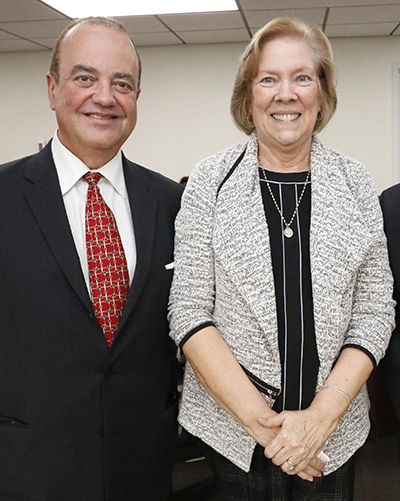 Incoming Respect Life Director Juan Guerra poses with his predecessor, Joan Crown, during her retirement party at the Pastoral Center Oct. 4. During the Oct. 20 tribute, a PowerPoint presentation led guests on a poignant trip down memory lane. It featured images of Crown in her heyday educating the public and legislators about all the pro-life issues, overseeing the day-to-day operations of the pregnancy help centers, and taking high school students each January to the March for Life in Washington, D.C.
She also took the occasion to pass the baton to her successor, Juan Guerra, who attended the event with his wife, Mary Kate, and their four daughters. She reassured everyone that they prayed for months before interviewing for a new director, so that the choice would be God’s. “I ask all of you to keep Juan and his family in your prayers,” Crown said. Guerra pledged to continue Crown’s legacy and mission so that all life, from conception to natural death, would be recognized. Father Rivero extended a special blessing over Guerra, invoking the Holy Spirit to give him the graces he needs to persevere. This article originally included the wrong last name for Sister Maria Jose. It is Socias, not Macias. Such a beautiful story on Joan Crown's retirement from the Respecct Life Office. She is truly admired by all. God Bless to her on her retirement.